A short break for Diwali snacks and sweets. What do you do during a movie break? But some popcorn and start the movie again right? I am doing the same thing too. A Popcorn Break today. When you are watching a movie you need something to munch and sip. 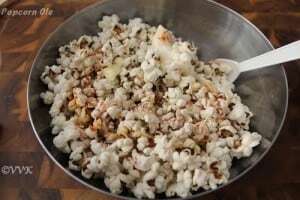 What’s better than homemade popcorn? Theatre or home, Tea or soda – popcorn goes well with any combo. 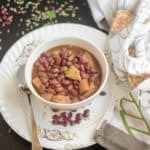 This recipe is called Popcorn Ole. It seems it is a very popular Mexican street food. It pretty much has all the flavors. Tangy, spicy and creamy with a bit of sweet – oh yum. 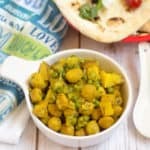 I learnt this recipe from my colleague and we tried this at our workplace too. (Err as I mentioned before we have a fully furnished kitchen with essential pantry items and other equipment too including popcorn popper) It was a great snack and I wanted to try it right away at home too. But then I don’t have popcorn popper at home. So I thought of popping it in the regular stove top way. 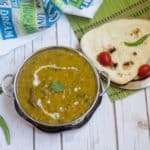 So here is the simple and delicious popcorn ole recipe. The highlight was kiddo loved it to the core. I thought he might not be ok with the spice but he was all up for it. I used the organic pop corn kernels from Costco. Also I made this spice mix in bulk. It can be used for any other salads or pasta recipes too. Now mix all this and store in an air tight container. Viola your spice mix is ready. 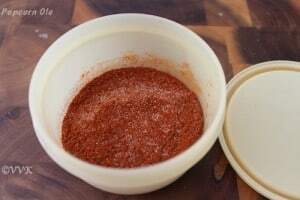 You can read about the difference between cayenne and paprika here. Heat a 3 quart (so that the kernels have room for popping) in medium heat. Add the oil and once the oil is hot add the kernels. Shake them nicely every now and then and when they start to pop close the pan with the lid. Once the popping sounds stops turn off the heat and transfer the popcorn. Spice mix – 2 tsps. 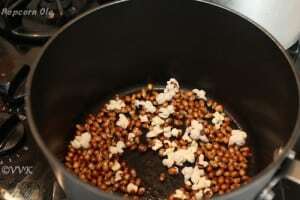 Right after you transfer the popcorn, add the butter and mayo so that the butter melts easily. Add the spice mix and toss them together. That’s it. Popcorn ole is ready. Enjoy it with your favorite movie. This looks really interesting! :) Saving it up…. Welcome here Rafeeda. Thanks a lot. Let me know how it turned out. 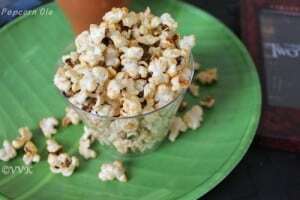 One can easily customize according to their tastes when popcorn is prepared at home and your choice of spices sound yum. 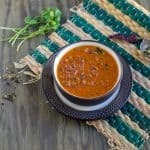 My older one will love the spices in there! Making homemade popcorn is so much fun. Toppings can be customized to one’s likes and dislikes. This is my kind of popcorn. Wish they served these at b the theaters as well. Popcorn is perfect for movie night. Your has turned out great. 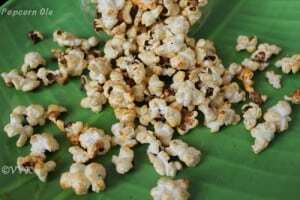 Wowo feel like munching this popcorn, too good and irresistible Vidhya.. Thanks da. Give it a try for sure. Our movie starts with guacamole and chips ;) I should do this soon…. I can have popcorn anytime!..and movietime is incomplete without this right.. 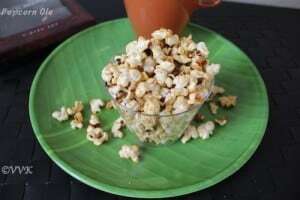 I love homemade popcorn too :) Actually its so simple to make and super cost effective too. These days we buy the corn kernels and make it for our night shows on TV :D Love your flavour combination Sri. We stick to cheesy popcorn or butter pepper popcorn :) Will try this for sure. same pinch. This spice mix along with mayo was really good GB. Give it a try and I am sure you would love it. So true that popcorn goes well with anything – tea, soda, coffee.